Robert Reddell won it all during the Toyota Tundra Bassmaster Weekend Series, operated by American Bass Anglers, East Texas Division 11 tournament, held April 13, 2013, on Lake Tawakoni.Running out of Holiday Marina in Wills Point to fish the 37,879-acre lake, the 46-year-old angler from Justin caught four bass weighing 20.22 pounds. He capped his catch with an 8.93-pounder that won the tournament lunker title. For the Boater Division victory, Reddell took home a check for $2,469. He added a $275 bonus for the big bass. In second for the boaters, Gilbert A. Herald, 46, of Pittsburg found a tournament limit of five bass weighing 17.08 pounds. He capped his catch with a 4.06-pounder to collect $1,234. In fourth place for the boaters, Randy Spence of Waxahachie landed five bass going 16.04 pounds. 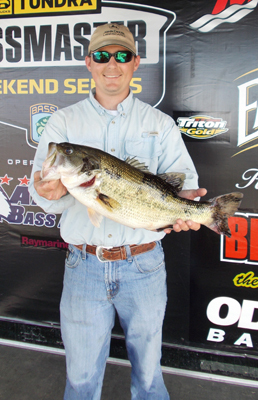 Pete J. Lewis of Copperas Cove followed in fifth place with five bass at 15.33 pounds with a 4.88-pound kicker. Michael L. Vining of Little Elm caught a three-bass division limit for 11.45 pounds with a 5.21-pound kicker. In third for the co-anglers, Charles A. Yowell Jr. of Allen landed three keepers going 10.48 pounds including one 5.04-pounder. Dillon J. Pechal of Ennis found three keepers for 10.25 pounds. He anchored his catch with a 5.90-pounder that set the division lunker standard. Cory Campbell of Kerens rounded out the top five co-anglers with three bass and 10.20 pounds.